From Dr. Craig Stevens: Happy New Year! It is that time of year when we pause to reflect on the past and plan for the future. 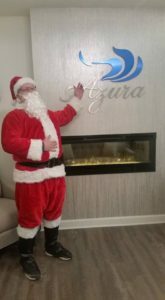 I am very grateful for all of the support that our patients and friends have shown Azura Skin Care Center this past year. As a new business in a crowded field, Azura is coming along very well. We have a beautiful space, dedicated and talented staff, and beautiful, loyal patients. Our dedicated staff at Azura Skin Care Center in our beautiful Cary, NC office. We’ve had some fun parties, shared good food and drink, and even had a visit from Santa Claus! Azura has truly been blessed. We look forward to the New Year with renewed hope for continued success, more fun parties, and more aesthetic services. We look forward to our new partnership with Miss North Carolina USA and Miss Teen North Carolina USA as well as with Aegean Medical Services and Dr. Angelo Tellis. Azura Skin Care Center is proud to support community organizations like Miss North Carolina USA (Katie Coble), Raleigh Moms Care, Western Wake Crisis Ministry, Carolina Tiger Rescue, and more. We look forward to using our new laser and new devices, helping our existing patients and friends look and feel their best, greeting new patients and making new friendships; and we look forward to making new memories with all of you. God bless us all and Happy New Year!